"Another delightful variation on the Poke Cake theme." Preheat oven to 375 degrees F (190 degrees C) grease and flour a 9x13 inch pan. Pour batter into a 9x13 inch pan. Bake at 375 degrees F (190 degrees C) for 25 to 30 minutes, or until toothpick inserted into cake comes out clean. Remove cake from oven and poke evenly with a fork every 1/2 inch. Frost while still warm. In a medium bowl, combine confectioners sugar, 3 tablespoons water, 3 tablespoons oil and orange juice. Mix thoroughly and pour over cake, allowing it to saturate cake. Wonderful cake that wasn't too lemony! Great glaze, too. I served it with a pretty lemon/orange/lime sherbet and it went perfectly. Thanks for the recipe! 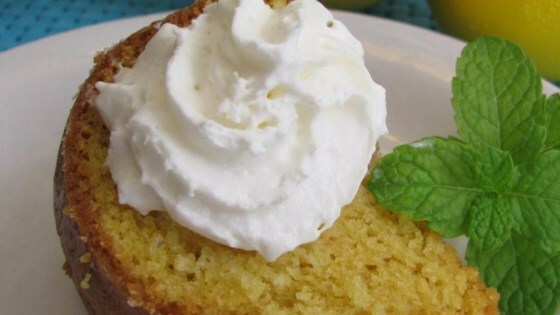 A very moist, very lemony cake. I also make an additional glaze of lemon juice and powdered sugar to go over it after it is cooled...YUM! This is my favorite cake, hands down! It is very moist and delicious! I will make this over and over and over. Too sweet for me, but the others loved it! This cake was good i just wanted a little more lemon but overall it was good. This cake is sooo moist and good. It didn't last long in this house and everybody's looking forward to the next time.